A key challenge for the research industry – and any company seeking feedback from its customers – is gaining participation. There have been books written on how to reduce non-response (i.e. increase participation), and tactics often include providing incentives, additional touch points, and finely crafted messaging. All good and necessary. But one trend we’re seeing more of is the minimalist “survey.” One question, maybe two, to gather point-in-time feedback. You see this on rating services (e.g., Square receipts, your Uber driver, at the checkout, etc. ), simple email surveys where you respond by clicking a link in the email, and texting feedback, to name a few. Recently, travelling through Iceland and Norway, I ca me across this stand asking “happy or not” at various points in the airport (e.g., check-in, bathrooms, and luggage claim). Incredibly simple and easy to do. 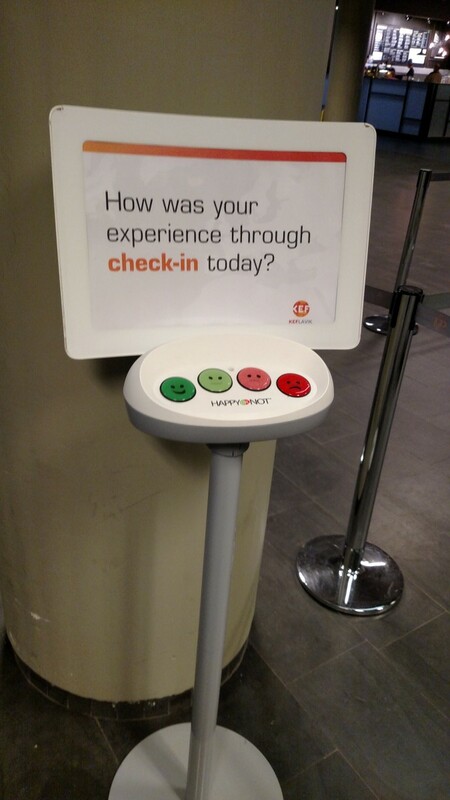 You don’t even have to stop – just hit the button as you walk by. A great idea, sure, but did people use it? In short, yes. While I don’t know the actual numbers, based on observation alone (what else does a market researcher do while hanging out in airports? ), I did see several people interact with it as they went by. Maybe it’s the novelty of it and in time people will come to ignore it, but it’s a great example of collecting in-the-moment feedback, quickly and effortlessly. Now, asking one question and getting a checkbox response will not tell you as much as a 10 minute survey will, but if it gets people to actually participate, it is a solid step in the right direction. Nothing says this has to be your only data either. I would assume that, in addition to the score received, there is also a time and date stamp associated with responses (and excessive button pushes at one time should probably be “cleaned” from the data). Taken together, investigating problems becomes easier (maybe people are only unsatisfied in the morning rush at the airport? ), and if necessary, additional research can always be conducted as well to further investigate issues. What other examples, successful or not, are you seeing organizations use to collect feedback? Does anyone have any feedback on these? Love the concept but my concern is only asking one question and not allowing customers to give more feedback might be an issue. We are considering options now, it’s between a similar kiosk Survey Stance ( http://www.surveystance.com ) or Happy or Not. I really liked the the survey stance one allowed you to capture email addresses and can rotate questions. Any feedback would be awesome! Oh and also does anyone know about buying through a 3rd party reseller vs buying direct? Any cost savings?